If you are planning a vacation or weekend getaway to Pigeon Forge, please visit MyPigeonForge.com to learn about everything our city has to offer and see why we are the center of fun in the Smokies! Click here to begin planning your visit. If you are interested in opening a business in Pigeon Forge, please make sure to visit the Department of Tourism. We can provide all the information you need to become a vital partner in one of the top destinations in the Southeast. 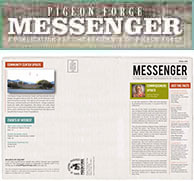 For information on the LeConte Center at Pigeon Forge, click here.